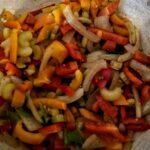 I’ve spent a lot of the last year experimenting with dehydrating my own meals for backpacking, with lots of picnic experiments this past winter! I don’t mind some of the commercially available backpacking food, but I don’t love how expensive they are or how much sodium (and other stuff) is in them. I decided I would keep it simple to not get overwhelmed and start with some of my favorite vegetarian meals first, and then once I mastered those take on some new recipes and some with meat. Vegetarian dehydrating seemed a lot less intimidating! This spring, I’m excited to share some of these with my readers so that you can skip over all the experimenting! 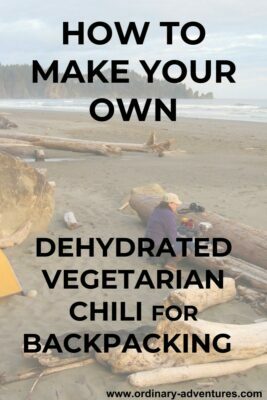 In this post I’ll share step by step how to dehydrate vegetarian chili for backpacking (but you can also enjoy this on a picnic or day hike). This is way easier than I thought it would be, especially since I usually just dehydrate the other half from dinner I would have made anyway! A few months ago, I shared my Spicy Vegetarian Chili that I’ve perfected for the trail (and dinner at home, and lunch and picnics, etc). I’ve included the recipe again at the bottom of this post. Note that a two cup serving of this chili is about 400 calories (see specific nutrition info in the recipe), so if it’s a tough day of backpacking you might want to add some additional calories (you could bring along condiments like cheese, or you could just eat it with a candy bar!). 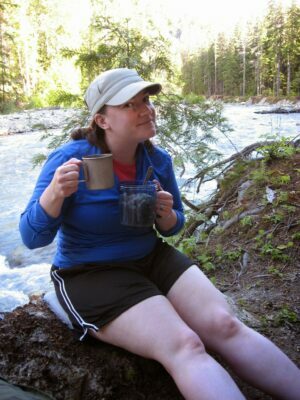 What equipment do I need to dehydrate vegetarian chili for backpacking? You’ll need two things to get started. The first is a dehydrator. The dehydrator I use is this one, and it works great (for lots of dehydrating projects including this). It costs about $60, which when you consider that if all you did with it was dehydrate chili and eat it instead of a commercial backpacking meal, you would save at least $5 each time (depending on how you are counting your servings, how expensive food is in your area and what brand of commercial meals you were buying), you would have it paid for in 12 meals. To dehydrate chili, or anything else liquid, or in general to make it less messy, you’ll also want some trays like these. The dehydrator comes with one tray, and the other tray is in a two pack so you’ll have a total of 3. Three is perfect to spread out half of this recipe (the recipe makes 8 cups, so if you save 4 cups to dehydrate, it will work perfectly in three trays). This is pretty straightforward. Just make the chili! I usually make it and eat half of it for dinner and dehydrate the other half, but you could dehydrate the whole thing too. Make sure not to skip the step of using a blender! This makes it easier to work with, dehydrates faster and rehydrates better as well. Make sure to measure out 4 cups of chili to dehydrate. Easy! You put the trays in each level of the dehydrator and spoon the chili onto them. Spread the remaining four cups of chili evenly among three trays (shown stacked in photo). Spread the chili as evenly as you can so that it dehydrates quickly and easily. The color will vary quite a bit depending on what type of beans and color of peppers you used. Once that’s done, place the lid on top of the trays, set the temperature to 135 degrees (the model I have has a dial for different temperatures and this temperature is labeled “vegetables”). Plug in the lid to start dehydrating (on the model I have and recommended above). Step 3: How long does it take to Dehydrate vegetarian chili for backpacking? 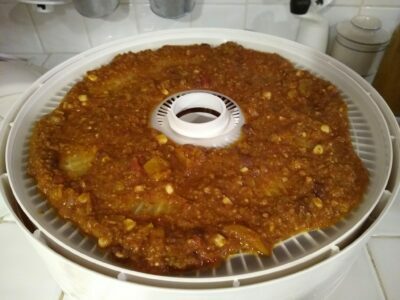 What I do is make the chili in the evening, then put it in the dehydrator overnight and unplug it in the morning, which is usually about 8-10 hours. It’s totally possible it would be ready a bit sooner, but this way is easy for me and I’m all about easy! It will be dry to the touch and much smaller in volume than when you put it in. Honestly, it won’t look very appetizing at this point, so trust the process! If it’s dry, you’re good. There are a couple of ways to do this, the first is to put it directly in the container you’re going to eat it in. If you’re going to be using it quickly and you know when, then you might as well just do that. I’ve done that quite a bit for picnics. If you’re not sure, and you’re not using it immediately, I would package it in freezer safe zip top bags. If you follow what I do and you dehydrate 4 cups of chili total, if you split that into two containers, you’ll have two 2 cup servings. Or you could put it all in one ziploc and divide it later. Try to get the amount split as evenly as possible if you’re splitting it in two, in order to keep the ratio of water correct for rehydrating later. If you’re going to be keeping it for awhile, put it in the freezer (I’ve kept it for a couple months in the cupboard and it was fine, but I’ve read that if you’re going to keep it longer it should be in the freezer). 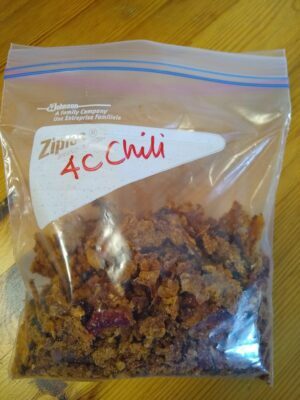 The dry equivalent of two 2 cup chili servings in a ziploc bag, ready for adventure! Step 5: Rehydrate the chili for dinner! To rehydrate, you’ll need a container to rehydrate in. I use one of the following two options: 1) 16 oz thermos or 2) GSI fair share mug. Either one works great (or any other container you have for eating hot food on the trail as long as it has a lid). The GSI mug is twice as big as the thermos, which is good and bad (if you wanted to have 4 cups of chili for example you would need the bigger one). The thermos will keep it hot longer, if that’s a priority in the situation you’re going to be in. The GSI fair share mug is also much lighter (good for backpacking). The only thing that’s really important about the container is that it must have a lid. This is critical. Without a lid, it won’t rehydrate! The other thing I’ve learned is important is that the water must be boiling (I have tried to do it with hot water I carried in another thermos and it wasn’t hot enough). If you already have the dehydrated chili in two containers, you’re ready to go. If you haven’t, then split into two portions (or double the water). Add 12oz (1 1/2 cups) of BOILING water to the mug. PUT THE LID ON. Do not open the lid for approximately 15 minutes. I was surprised that this rehydrated faster than commercial meals, but it has less volume so after I thought about it it made sense. When in doubt, longer is better for rehydrating! Step 6: EAT AND LOVE! Happy Camper with homemade food on the trail! Spicy vegetarian chili that is perfect as leftovers to take with you on the trail in your thermos or hydroflask. Lots of flavor and nutrients!! 3. Add the tomatoes, beans and corn, cook until it’s all heated through, bubbly and delicious looking! You can use any kind of beans you like! I usually use one cup of black beans, one cup of pinto beans and one cup of kidney beans, but I sometimes mix it up based on what’s in the cupboard! The jalapeno is what makes it spicy. If you don’t want it spicy, leave it out. If you want it more spicy, add another jalapeno!